You're reading this review because you want a budget fitness tracker but you either can't or won't spend much money on one. The Xiaomi Mi Band is now on sale for $15 on Xiaomi's online store for the US, UK and Europe after Xiaomi sold millions in China and at least six million worldwide. So the price is right. But how's the tracking? This is how you design a budget wearable. Keep it simple, stupid. The Mi Band consists of the oval-shaped tracking module which has a matte chrome finish and neat, chamfered edges and a (default) black or colourful, rubber band. That's it - no fiddly clasps, no buckles, just a neat, cheap tracker that everyone can wear. In the app, there is an option to choose left hand, right hand or neck placement so perhaps Xiaomi is working on Misfit-style necklace accessories too. With an IP67 rating, the Mi Band is waterproof down to 1m for up to 30 minutes - even the Jawbone UP3 couldn't manage that. It's ridiculously light, too, and doesn't restrict wrist movement in any way like some smartwatches and bigger activity trackers do. So much so that you barely notice it on your wrist - especially important as it tracks sleep as well as steps. One downside is that both parts are easily scuffed - we're not sure how long the Mi Band will last when worn everyday for months on end. The Mi Band's main competition at this price are $5 pedometers and well, just using Google Fit or Fitbit on your phone without a wearable device at all. But it functions well as an anchor too - the act of putting it on the morning can make you more likely to have your goals in mind. There's no display but there are three LEDs on top - the colour of which can be customised in the Mi Fit app - to show you your progress. For instance, the bottom LED will blink if you're less than 30% of the way towards your goal. In theory, the LEDs behaved when charging but didn't perform as they should when we flicked our wrist. It's forgiveable at this price - it's $15! - but the LED function would have been a big Fuelband-like tick in terms of motivating the user if they actually worked properly. The Mi Band's tracking is somewhere in between apps such as Google Fit and Moves and trackers with real sensors such as heart rate monitors. It tracks steps, distance and estimated calories burned as well as providing a timeline of how long you are active each day. It breaks your day into walks, runs and activities in a somewhat whimsical fashion - that is, in a day when you have decidedly not been running anywhere, you will find a 'run' recorded. This is pretty annoying but in terms of goals - for instance step goals - these are easy to keep tabs on without getting too bogged down with what the Mi Band thinks you've been doing. We found the Mi Band slightly overestimated our steps and distance travelled each day so bear this in mind when you're snacking on that fried chicken sandwich because you've smashed your goal. Sleep tracking is much the same, with the Mi Band often out by at least half an hour which might be down to the fact that it's automatic - you don't need to tell Xiaomi you're going to sleep. It claims to track how much deep sleep and light sleep you've had each night - tricky to tell how accurate this is but given that our hand movements seem to be clocking up too much activity, we'd say the light sleep figure is probably also too high. So it's not the most accurate tracker out there, no surprises here. But, particularly for activity tracking, it could still be more useful than a basic pedometer (no stats) or using your phone in which case the battery will run down. The Mi Band connects over Bluetooth, of course, but if you don't need the caller alerts (see below) it doesn't have to be synced all day. 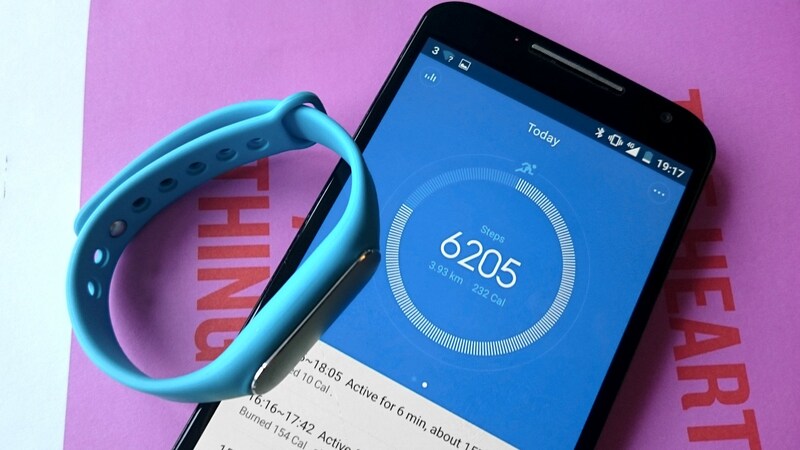 It's also worth pointing out that the Mi Band is compatible with both iPhone and Android and works with Google Fit. The Mi Band has a couple of non-fitness features including an alarm and vibrations when you get a call. It's a shame that it can't vibrate when you get text messages and WhatsApps - as smart jewellery without displays do - but again Xiaomi is sticking to the basics to keep costs down and that battery life long. If you have a Xiaomi phone - which you probably don't - you can also set up the Mi Band as a safe device with its Smart Lock feature. So when the Mi Band is near, your phone unlocks automatically. It's a nice extra, and will do well in China where both Xiaomi phones and Mi Bands are much more common than in the UK, Europe and the US. It would be great to see this feature rolled out to all Android phones but that's no doubt out of Xiaomi's control for now. A point before we jump into the app experience - generally the Mi Band syncs fine but the first time we paired it with our Moto X, it took us at least five tries, once in which the app said there were too many devices nearby. Fair enough. The app is really basic with a profile detailing your average steps, total days using the app and total km walked as well as height and weight. That's on top of the main screen of graphics showing how close you are to hitting your daily steps target, a timeline of activities as well as the usual weekly chart. There's not much in the way of long term motivation but you can set up the app to send you a notification after 9.30pm every day with your day's progress with a similar alert each morning to detail your sleep. Xiaomi has a really great opportunity to expand the Mi Fit app before it launches any other wearables. It already has a lot of users in Asia and it could jump ahead of Jawbone and Fitbit in offering actionable insights that tap into habit forming tactics. As we said, the hardware is light, easy to get along with and the absolute cheapest around - build a killer fitness and lifestyle app and a version 2 Mi Band with improved accuracy and Xiaomi could be unstoppable. Xiaomi says the Mi Band is good for 30 days between charges and we've no reason to doubt that. After a week of wearing the Band, the percentage displayed in the app barely budged. That's not as impressive as a Misfit Flash or Jawbone UP Move, both of which don't have displays and can last six months. But again the Mi Band is cheaper than both of these and 30 days is much, much better than any wearable with a screen as well as high end trackers which typically last a week. Charging is quick - from zero to full in less than two hours - and easy enough with a proprietary cable which the tracking module slots into. It's short and easy to lose though so keep an eye on it. The Mi Band is far from perfect but with a lot of the niggles we encountered, we had to stop and remember this is not a device ten times the price, it's $15. That means it's well worth a punt if you're not sure about fitness trackers or about wearables in general. Just remember to check your activity timeline to make sure it's not gifting you hundreds of steps and the Mi Band could be a great bargain fitness tool. A starter tracker for anyone not sure they are ready to take the plunge with a Fitbit or Jawbone.